I played with the new irons today. Ben Hogan Apex Red Lines, c. 1989. They’re wonderful. Glad I bought them. Great balance, great feel, smaller sweet spot than my 2003 Apex’s, but what a sweet spot. I figured since I would be playing with 22-year-old irons, I should play with a driver of similar vintage, too, so I brought along my Wilson 4275. Laminated maple. Head smaller than your fairway metal. Shaft two inches shorter than my metal driver. Weighs two ounces more. It took a few holes to get the idea, but I was hitting it straight, not as high, but it ran and ran. I lost distance, but not so much it affected how I played any of the holes on this course. It’s going to stay in the bag. The shorter shaft and heavier weight somehow combine to give me more feel of the club throughout the swing, and swing in a more controlled way. My two-putter experiment is working out nicely. I use an Acushnet Bullseye for everything except the shorties. For the ones about four feet and in, I use a Wilson Billy Casper mallet. I guess this all means you can be creative with the clubs you use, and pick the ones that make you feel the best about getting the ball into the hole. And why not? Your game belongs to you, not the equipment manufacturers. I got a new set of irons today. Ben Hogan Apex Redline, built in 1988. So they’re not new, but they have a reputation as being the pinnacle of the Apex line of Hogan irons. I bought them on eBay a few weeks ago, and took them straight to the pro shop after they arrived to get them fitted (+1 inch in the shafts). New grips come with that, too. So this morning I picked them up took them to the course to play a round. Wow. Triple wow. They have such superb balance, and the sweet spot is sweet beyond belief. I think I’m going to like these clubs. I suppose you noticed that Graeme McDowell laid up on the 72nd hole a few days ago instead of going for all the distance he could muster. Smart. You should do that, too. It’s good to be able to pitch on from 30-70 yards or so, but it’s even better to avoid those distances if you can. Shots from there require finesse. You never know just how they’ll work out. Find a distance that is comfortable for you to hit into the green with a pitching wedge using a full, not-holding-back swing. That might be right around 100-110 yards. You’ll use this strategy most often on a par 5. Say after your tee shot you have 280 yards to the green. If you hit your fairway wood, you might leave yourself 70-80 yards into the green. Tough shot. Instead, hit a shot that will cover no more than 180 yards. That will set you up at your comfortable distance with that pitching wedge. Or say there’s only 240 left. Hit a 7-iron and a wedge. If you can’t reach the green, divide up a big distance into two easy ones. Closer is not always better. Eating up yards doesn’t help you if it leaves you with a difficult shot. Play easy shots that set up easy shots. Golf is much simpler that way. Yesterday the U.S. Open was on TV from 10 a.m. to about 7 p.m. Guess how much of it I watched. That isn’t a trick question. If you said, “All of it,” you’re close to being right. How can you not watch Pebble Beach on a sunny day? Even the “inland” holes are gorgeous. No wonder we gladly fork over $425 to play a round there. I didn’t stay parked for all that time, I would go out and do a bit of yard work, hit some balls in the backyard, fall asleep on the couch, but I overall I saw a lot of golf. Phil caught fire, Tiger did squat, and I don’t know how many players I saw get eaten up by the green complex around number 14. That’s why I love the Open. It’s the people’s major. It makes players take 8s and 9s. When’s the last time they made an 8 on a hole? When’s the last time you made one? Welcome to our game. Today I have a barbecue to go to in the afternoon so I’ll only get to watch for an hour or so. Just as well. My eyes need the rest. But tomorrow, my favorite day of the year, I’ll be there for every shot. I hope all of you get to see it, too. This morning I’m going to the range for my bi-weekly workout, down to the stadium to run the stairs, then home to watch the opening round of the Open. Really pulling for Phil this week. 1913 – American kid Ouimet beats the English giants Vardon and Ray and American golf is off the ground. 1932 – Sarazen plays the last 28 holes in 100 strokes to win. 1951 – Hogan plays it safe for three rounds, then decides that strategy is getting him nowhere and attacks during the fourth round, wins. 1960 – Arnold Palmer becomes ARNOLD PALMER and professional golf takes off. 1964 – Ken Venturi was barely able to stand up in the afternoon round because of the heat. This one is the triumph of courage over pain, not Tiger having an owie in 2008. 1966 – Palmer’s shocking collapse. Gave back what he took in 1960. The end. Deflated. Had he won this, he could have won five or six more majors. 1973 – You just don’t shoot 63 in the final round to win the U.S. Open. 2009 – Not one for the ages, but the final round was High Drama. So many players challenged all day, not just on the last few holes, and Glover didn’t flinch. Enjoy the Open. It’s the people’s major. In just a few days, hopefully tonight, pro basketball will be over. Hockey is over. Football hasn’t started up yet. It’s that glorious time of year when for about six week the only two sports in the sports pages will be baseball and golf. Our minor league baseball season starts Friday the 18th. What better way to spend a summer evening than out at the park with a warm beer (it starts out cold, but doesn’t stay that way for long), a ball game in front of you and a good friend beside you? What better way to send a summer day than out on the links? As good as that sounds, this week we go one better. We stay glued to out TV watching the U.S. Open. Formerly the National Open. This is the THE tournament for me. The courses are scary, this year the course is beautiful and scary, and they play recreational golf. Really? Take a look. Pars are at a premium, bogeys are to be had by the fistful. Welcome to our game. 364 3/4 days out of the year I’m fairly agreeable and I’ll go along with whatever you want to do. But on the 1/4 day, when the final round of the U.S. Open is being played, I’m not available. Just don’t call me. I’m glad they play the Open early in the summer. I couldn’t wait any longer than I already do. 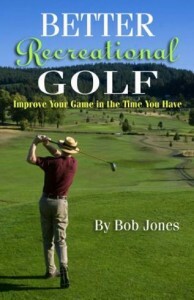 Most recreational golfers want to lower their score by making more pars. Forget pars. Go for birdies. That’s how you lower your score. How do you go for birdies? Hit your approaches pin-high. Always have enough club in your hands to get pin-high. If you’re at the limit of the range for a certain club, take one more club, grip down, and swing away. On par 3s, take one more club than the yardage indicates. You’ll find yourself having a lot of 8- to 10-foot birdie putts that you never had before. 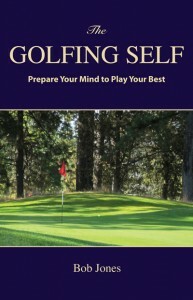 Did you go to the range today and work on a shot that had been troubling you? Did you figure out how to hit it? Did you write down what you did to make it work? No? Then you just wasted that practice session, because you won’t remember. Bring a notebook and write down the winning formula as soon as you have figured it out. Even if you go back to that shot a half hour later, chances are great you have already forgotten what you did right. Keep your putter low on the follow-through. If you feel a pulling or stretching on your upper right arm as you follow through, you have kept your putter low. Don’t ask why. Just try it. This seems to be the week for putting tips. That’s what happens when I have a terrible day on the green and start working on making things better. Because the stroke is longer, it’s harder to keep the putter on line when you hit a 30-foot putt than a 6-footer. We all know that we concentrate on speed rather than line when we hit that 30-footer, but there’s nothing wrong with keeping the ball on the line you chose so it can go in. Practice this at home by setting up a tin can lid as a hole and a block of wood a foot or so behind the lid to act as a backstop. From about eight feet away, put your 30-foot swing on the ball and make sure it goes right over the center of the lid. There’s no reason it should not. The longer stroke makes it easier to miss hitting the ball off the sweet spot. Since contact on the sweet spot is vital for consistently gauging speed, and direction is affected, too, that is essentially what you’re practicing with this exercise. When you get to the practice green you can practice hitting the putt different distances, but get your stroke down at home first. I was out at the range this morning for my weekly practice session and noticed something that I started doing unconsciously while hitting short putts. I was gripping down. I found myself gripping down about an inch, to get more control of the club, and man, did that work great. I miss short putts, see, and anything that will help me make them I’m all for. This is a pretty good discovery. Everything about the stroke stays the same, just grip down an inch or so and that seems to give me a feeling of great confidence. Maybe it will help you, too. Dave Stockton has become the putting guru of the moment. One of his bits of advice is to not take a practice swing. Get your feel for speed as you make your read and go with it. 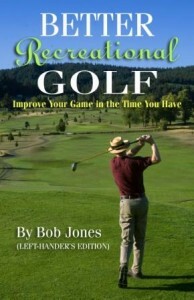 I tried that yesterday and putted like I’d never played golf before. All my approach putts stopped short and left. Way short, like 3-4 feet short. By the seventeenth hole (I don’t give up easily) I’d had it. I went back to making practice swings, and what do you know? I left approach putts on the last two holes less than two feet past the hole! Just goes to show you. Be real careful with what you read in a golf magazine. You can trust whatever is in this blog, though.